A number of members of the Plumbing Product Industry Group attended a joint New Zealand/Australian business conference in August to exchange ideas affecting the plumbing sector across both nations. Plumbing Connection reports. On 22 August, the Plumbing Product Industry (PPI) Group had its General Meeting in Wellington, New Zealand, followed by an industry forum. This provided an opportunity for PPI Group members and guests to discuss the issues affecting the plumbing industries in both Australia and New Zealand. The Plumbers, Gasfitters and Drainlayers Board (PGDB) of New Zealand chief executive Martin Sawyers hosted the event, welcoming PPI Group president Scott Michaels and other members of the organisation and travelling group to the event. The morning session saw a presentation by Ministry of Business Innovation and Employment team leader for building policy Caroline Heath on how New Zealand product regulation and assurance systems work. While there are some notable differences, both countries remain committed to their own paths. The Australian team brought with them Professor Mark Taylor from the Department of Environmental Sciences, Faculty of Science and Engineering at Macquarie University, who outlined his work in relation to lead in potable water. Mark has done a lot of work in the area of lead and recently produced a paper for Australia Building Code Board (ABCB) consideration. Other speakers for the day included JAS-ANZ chief executive Dr James Galloway, the Department of Agriculture’s Water Efficiency and Labelling Section director Dr Carol Grossman and Standards Australia senior manager of stakeholder engagement Brett Lovett. James credited product certification companies for WaterMark compliance, while Carol addressed some key issues about the success of the Water Efficiency Labelling and Standards (WELS) in the Australian market. 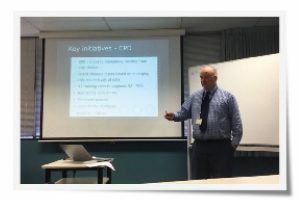 Brett outlined the development of an ISO Standard for water efficiency labelling and spoke about a recent meeting held in Sydney with international representatives to discuss the development of this Standard. From an Australian point of view, it was very interesting to hear from Martin Sawyers about how New Zealand’s 100-year old independent statutory body continues to serve the whole country. New Zealand is a proud nation that displays a strong focus on public health. At the core of this is the management of plumbing installations and installers. The PGDB appears far more resourceful than Australia’s six state and two territory regulators, something not lost on the attending Australians. With no state governments in the way, the Kiwi’s are far more efficient and better equipped to respond to licensing needs than we experience in Australia. Continuing professional development (CPD) has been talked about for more than 20 years around Australia but other than in Tasmania, it just hasn’t happened. New Zealand has moved to mandatory training and its training topics are based on their own emerging risk and analysis data. There are 43 training days run across the north and south islands, which offer plumbers ample opportunity to get to the face-to-face training events. Around 25% of the remaining training is delivered online. In terms of delivering plumber qualification examinations, New Zealand has electronic exams, literacy assessments and oral competency testing. There is also an apprenticeship being prepared that will be offered in Mandarin. The driver for this is that more than 50% of Auckland’s population will be of Chinese origin by 2050. The PGDB is also investing its stakeholder’s fees back into public awareness media campaigns and phone apps like ‘Report a Cowboy’. Our thanks go to Martin and his colleagues, and though it was only a one-day conference, we did have the pleasure of two dinners (due to flight times) and enjoyed the Kiwi hospitality as well as some excellent wines and fare. They are certainly doing something right.